View of “Rey Akdogan,” 2017, Hannah Hoffman Gallery, Los Angeles. Rey Akdogan’s works touch on invisible standards and everyday objects, such as crash rails, in order to mine emotional reactions and systemic analysis. The latest exhibition of concise gestures by the New York–based artist is on view at Hannah Hoffman Gallery in Los Angeles through August 26, 2017. I AM INTERESTED IN MOTION, our everyday lives, and how we move through space. Each of my works extracts elements from much larger systems. And usually they are standard systems that perform specific tasks in our everyday lives. A standard is something that—if it works well—we don’t usually register. It is not an evident part of our visual universe. For instance: You go into a supermarket. You just want to get a bag of carrots, and they look fantastically orange there. You bring them home. You unpack them. Then, all of a sudden, they are not so orange. The plastic they’re wrapped in is tinted, and the supermarket’s light had an effect; both of these layers react, and they become something—an environment. The French cleats used in the exhibition typically exist between an artwork and a wall. Yet, they have a strange quality when you extract them from their normal function. They become visible. French cleats have a specific shape. They have two parts, with standard interlocking angles and types of wood. It’s all very specific. Usually the visible edges of a French cleat are painted to match the color of the artwork it supports, to make the cleat less visible. In the “Faction” works at Hannah Hoffman, I wanted to reverse the application of the paint, by placing it on the angles and surfaces of the cleat that are usually unexposed. But there are actually functional cleats behind the “Faction” works too; there are cleats holding the cleats in a stack. That’s how they are. 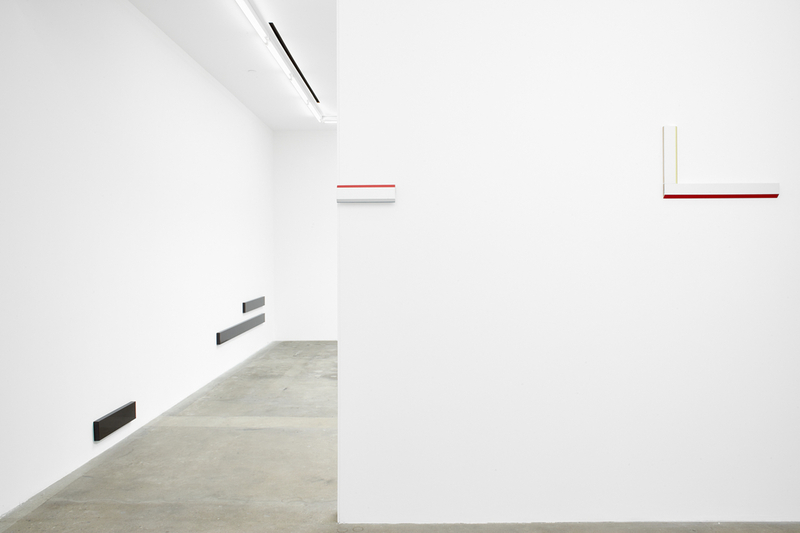 On one of the long walls at Hannah Hoffman I replaced the gallery’s usual matte white paint with a high-gloss commercial paint typically used for machinery or architectural facades. The visibility of the wall was alienated; it became mirrorlike. This type of paint also yellows over time if it is not exposed to sunlight. The standard UV-filtering properties of the gallery will set this process in motion. There was a period when I had to spend a lot of time at the hospital, sitting in waiting rooms for hours and hours. They are such strange environments. I was looking around and saw these odd things projected slightly from the wall, almost like trompe l’oeil objects. I thought, What is this? Then, I started noticing them everywhere. They’re in corridors; they’re in elevators; they’re found throughout public buildings and institutions—universities, post offices, you name it. Some of the works in the show are these objects called “crash rails,” fixtures with specific measurements that protect walls from scratches and marks. They usually have to be approved through all sorts of administrative offices. They also have to be sturdy in a specific way. I’m interested in how their varying physical appearances are largely determined by how they operate. That sort of operational abstraction is what holds together the construction of ambience.